I am overwhelmed beyond words by the outpouring of support for me at the Chicago Marathon! So many people and so much money! YOU are what Team in Training is all about. This is an avenue for all of you to give hope to those fighting cancer. As individuals, we can touch a few. As a TEAM, we touch thousands! This passion of mine is only possible because of generous donors who help make my dreams a reality. I can only stand back and shake my head in amazement at what we have accomplished together. Drum roll please…..$4,627! That is HUGE!!! Over 70 different families from all over the country, and even overseas have made this happen! You reached deep to support me, to honor my Mom and to honor your own loved ones. Your sacrifices will indeed change the lives of those affected by these vicious blood cancers. I am blessed with amazingly generous friends and I cannot begin to express the gratitude I feel. I wish I could reach out and hug each one of you. From the bottom of my heart, I thank you! Many people have asked where I find the determination to take on marathons. Partially it’s because I am truly my Mother’s child and I’m half crazy. The rest of it is because it’s personal, but without the help of all of you, none of this would even be possible. You have played a vital role in the success of my quest for a cure. I want to share with you the success that I have seen first hand and you will understand why your role is vital. Mom’s leukemia diagnosis came in 1996. Fortunately the disease progressed slowly and it wasn’t until 2002 when she needed her first round of chemo. The chemo was successful in treating her cancer but the side effects were horrible. Several months into her treatment I went with her to the doctor. My memory of that day is still vivid. The doctor offered Mom a deal she couldn’t refuse. She could stop treatment immediately and avoid the torturous side effects of another month of chemo. The doctor described it as gambling. He said she could walk away with the progress she had made and bet that research over the next few years would result in a new drug that she could better tolerate. She took the bet and ran. I’m not much for gambling. I prefer the sure thing. I decided I would do whatever I could to ensure the right drug was ready when Mom needed it. A couple years later I discovered the partnership between Team in Training and the Leukemia and Lymphoma Society. I realized this would be the way I could directly impact cancer research and drug development. I ran the Country Music Half Marathon with TNT in 2006 and the San Diego Rock ‘N’ Roll Marathon with TNT in 2008. Early last year it became clear that Mom would need chemo again. There was one lingering question that we needed answered. What would be the drug of choice this time? Would her only option be the same drug from 2002 that she could not tolerate, or would her bet pay off? You can guess how this story ends. Indeed there are new drugs in use now and she received some of them during her chemo last year. When the doctor told us that he would be using a new drug, miles and miles of pavement flashed before my eyes. The aches, pains, tears and agony of Nashville and San Diego were all worth it for that one moment when the bet paid off! This is why I run and this is why you give, for that one moment when a doctor can give a patient good news. Medicine is not an exact science and no two people are exactly the same. What works for one does not necessarily work for another. Research and drug development must continue. Your generosity ensures that research goes on. You are paying it forward and I’m forever grateful. The Chicago Marathon is all about celebrating life in our family. A marathon is a shining example of my Mother, her perseverance, her dedication, her adventure and quite frankly her “get over yourself and just do it” attitude. Thank you for trusting me to run the race until the finish. Many, many thanks for CELEBRATING LIFE with me! 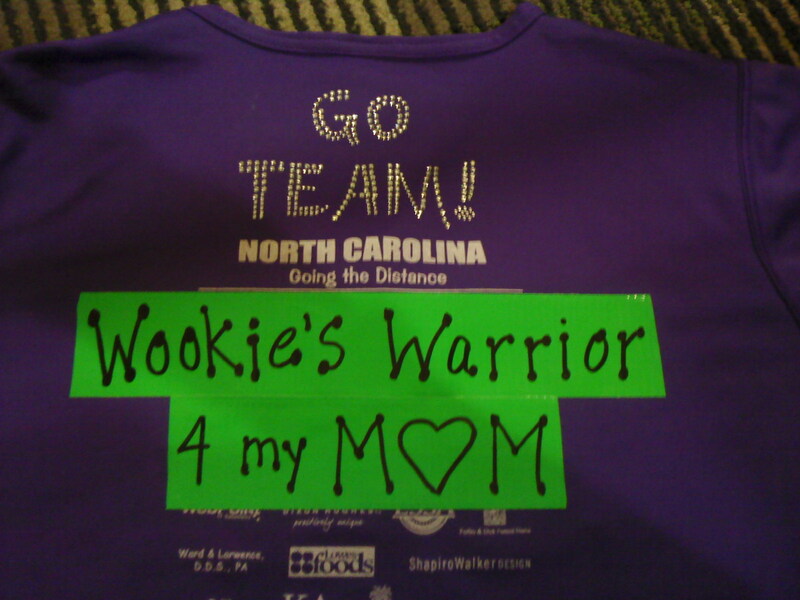 This entry was posted in Family, Running and tagged Chicago Marathon, Leukemia & Lymphoma Society. Way to go, Gatewood! I am so proud of you. Your strength and determination are an inspiration to us all. Gatewood you are an inspiration to all of us. I am so proud to count you as a friend.